It can be easy to fall for the surreptitious lies sold as truths by sophisticated and genuine looking rogue security tools such as Security Defender. The problem with these false security tools is that they are completely unable to live up to any of their over embellished promises. 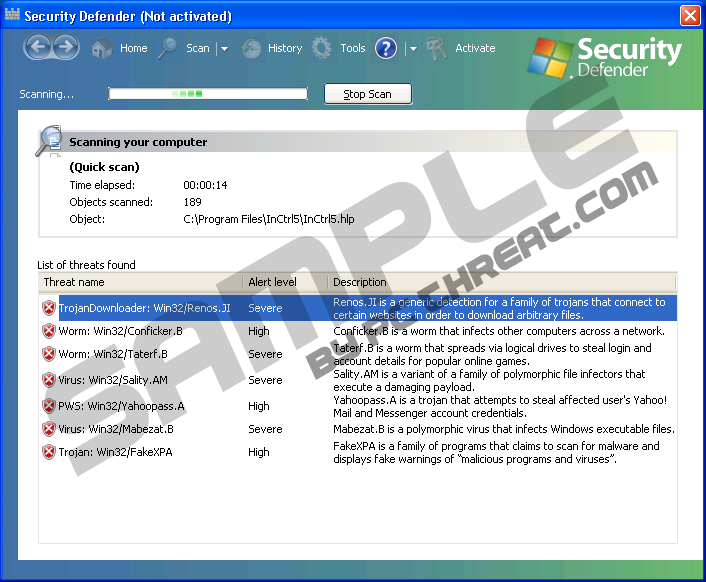 Security Defender, a direct clone of Antimalware Defender, is an antispyware application out to rip hard working consumers off. Despite what Security Defender would like its prospective victims to believe, it has no ability to detect, quarantine or remove any type of threat or infection, and is nothing more than an infection in itself. Security Defender’s infiltration into any system is virtually undetectable. This makes it even harder to identify and get rid of Security Defender. Security Defender makes use of Trojan horses to spread its infections to unwary PCs. These Trojans are distributed through a complex network which includes browser hijackers and fake online malware scanners. These browser hijackers forcefully redirect users to their compromised landing pages and subsequently deliver and root the Security Defender Trojans and malware into their systems. The first inclination the user will have of Security Defender on his system will be when it reveals itself by spamming the user with various fake security alerts. These alerts were designed explicitly to cause panic in the user, and to place Security Defender in an authoritative light. But once you are to follow the rogues urges to purchase the full version of the program you are greeted by a notification, saying that Security Defender would cost you “only” 79.99 USD, and you will be able to “save” the additional 50 USD. That is obviously false, because once you provide these criminals with your credit card data; they can rip off a lot more. Quick & tested solution for Security Defender removal. Click here to deactivate it. Defender to remove immediately harmful software. Spyware.IEMonster process is found. The virus is going to send your passwords from Internet browser (Explorer, Mozilla Firefox, Outlook & others) to the third-parties. Click here for further protection of your data with Security Defender. Your computer is being attacked from a remote machine! Block Internet access to your computer to prevent system infection. Windows Firewall has blocked this program from accepting connections from the Internet or a network. If you recognize the program or trust the publisher, you can unblock it. External software tries to control variety of your system files. This may lead to breaking of some data in your system. Click here to protect remote access to your PC & delete these programs. It is highly recommended that you clear your computer from all the threats immediately. Your computer is under the infections threat. Run instant shield protection to safe your data and prevent internet access to your credit card information. Select this to run instant shield. Security Defenter has detected malicious software that may cause crash of your computer. Click Remove All button to remove them now. Users who did not get rid of Security Defender in time complained about being unable to connect to the Internet, as well as being unable to launch any program on their PCs. Others complained about increased erratic system behavior and poor system performance. At the end of the day Security Defender will take control of your entire system and hold it ransom until you pay for its fake security software. Do not think by merely entering the above security key that you have successfully gotten rid of the threat on the system. This will only stem the annoying symptoms of this rogue, but you still need to obliterate Security Defender from the system in order to eliminate the threat for good and take back control of your system. Do not waste another second and destroy Security Defender from the system for good. THANKS YOU SO MUCH FOR THE ACTIVATION KEY! IT HELPS ME A LOT! how do we uninstall this crap ??? We recommend you to download Spyhunter antispyware. It should take you less then 10min to remove infection. Or you can delete it manually by searching listed files above. Thank you so much! You have helped so many people! Wow. where do I go to delete this? this seems like *****... again! this is an annoying scam how do i go about removing this crap from my pc ? My Security-Defender infected computer won't let me open the internet or any of these .exe files. It asks if I want it to run, I click OK, and nothing happens. Any suggestions? Notice that entering the given key wont remove the software - it is only silenced. You must still remove the program. Security essentials will get rid of it also. what do you mean? what program is that? thank you.. worked for me too.. I almost was going to wipe out my computer. thanks for the tip, although some users (especially amateurs) might find these DOS commands like swearing and is a bit too hard for them. This security key does not work for me. Do you have an updated key? We will look into this problem with the activation key.